Biography, Copper Engravings, Paintings of German Graphic Artist. One of the great Old Masters of 15th century German art, Martin Schongauer is best remembered today for his exceptional printmaking, notably his copper engraving, and his drawing, as well as his altarpiece art, all of which had a decisive influence on late Gothic painting in Germany. Schongauer was one of the most famous artists of the German Renaissance, whose work inspired such masters as Michelangelo and Durer. He himself was influenced by early Flemish painting, as well as the wider Netherlandish Renaissance, and focused mainly on religious art. Active mostly in Colmar, Alsace, his greatest masterpiece is his altarpiece Madonna of the Rose Bower (1473), which still resides in St Martin's church Colmar. In contrast with his earlier art, his later works have a softer, more delicate touch. Born in Colmar, Schongauer came from a family of artists. Two of his brothers became painters and engravers while two others were goldsmiths, like his father. No details of his childhood or early training as a painter or printmaker have survived, although it is probable that he learned the family trade of goldsmithing, after which he left to study at the University of Leipzig. NOTE: Schongauer's childhood coincided with the apogee of the Cologne School of painting under Stefan Lochner (c.1410-51) during the middle of the 15th century. As a painter, Schongauer worked in tempera as well as oils and was strongly influenced by the precision and colour of the Flemish religious artist Roger van der Weyden. 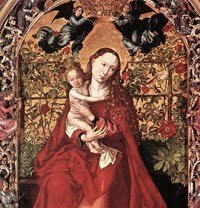 Out of the small number of works attributable to Schongauer, the Musee d´Unterlinden in Colmar (home of the Isenheim Altarpiece by Matthias Grunewald) holds eleven altarpiece panels: other known paintings include: The Holy Family (c.1470, Alte Pinakothek, Munich), Madonna of the Rose Bower (1473, Saint-Martin's Church, Colmar), The Holy Family (1475-80, Kunsthistorisches Museum, Vienna), and Nativity (c.1480, Gemaldegalerie SMPK, Berlin). In addition, he also executed a number of fresco paintings in Breisach Cathedral (1489-90). For another painting and printmaking movement in Germany, see the Danube School, led by the Regensburg painter Albrecht Altdorfer (1480-1538), and the Franconian artist Lucas Cranach the Elder (1472-1553). Schongauer's main focus however was printmaking, in which he developed a clear and well-ordered Gothic style. As in his painting, he chose mostly Biblical subjects, although he also produced genre scenes of everyday life. Without doubt the greatest engraver until the arrival of Albrecht Durer (1471-1528), he developed the technique of cross-hatching to suggest volumes and was the first engraver to successfully curve parallel lines, by rotating the plate against the burin. By the time of his death he had established a very important school of engraving in Colmar, which had a major impact on the next generation of German printmakers. Schongauer's most outstanding prints are those belonging to the series of the Passion and the Death of the Virgin, as well as the Wise and Foolish Virgins. His prints sold throughout Germany, and as far afield as Italy, England and Spain. They survive in several of the world's best art museums, notably the The British Museum, as well as print rooms in the Alte Pinakothek, Munich, the Gemaldegalerie SMPK, Berlin and the Szepmuveszeti Muzeum in Budapest. Schongauer died at Colmar, either in 1488 or 1491. Note: During the Medieval era in Europe, goldsmiths mastered the technique of engraving as a means of decorating and inscribing metal. Historians believe that they then began to print impressions of their designs to keep a record of them. From this emerged the engraving of copper printing plates to produce images on paper (old master prints), a process which occurred first in Germany during the 1430s, and in Italy soon afterwards. The Golden Age of engraving lasted roughly from 1470 to 1530, and featured masters like Martin Schongauer, Albrecht Durer, and Lucas van Leiden.  For more biographical details about famous German artists, see: Homepage.